The Watabe book is pretty much sold out now. I got myself a copy at Paris Photo, thankfully. No doubt it will appear on many 2010 top book lists. Printing is gorgeous, done in Germany, by a company which usually only prints ordinary text books, but which has outdone itself and its competitors. It certainly is a charming production; and yes, I’ve already noticed it on two “best-of” lists. I hope that his other early work in Japan gets a publisher. (The later Japanese work I’ve seen, of “kagura” or shrine dances, may be ethnographically valuable but to me it’s visually unexciting.) Unfortunately, prospects in Japan seem bleak: the elastic-band book is virtually unknown here and so Watabe’s name on a new book wouldn’t have much of an impact. 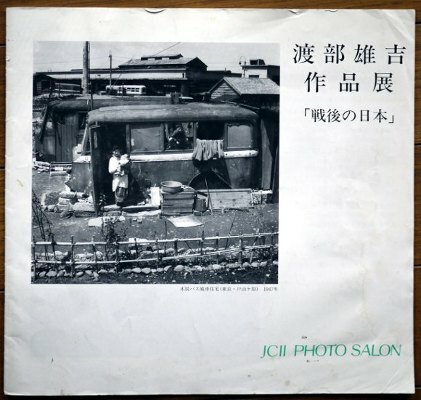 If you’re Kimura Ihei, your work from the 1950s is handsomely repackaged (and priced accordingly); but too many of the newer photobooks of Japan in the 1950s are aimed at the social history (or nostalgia) market and, it seems, designed by blockheads.